The family of baby Lauryn reached out to the firefighters from Station 39 in North Point who helped deliver her to include them in the birthday celebration. See photos. Happy birthday to 1-year-old Lauryn, whom local firefighters and paramedics in Reston helped deliver last year. Last year, Fairfax County Fire and Rescue members from the B-Shift at Station 39 in North Point received a call to help deliver a baby girl at a local home shortly before 11 p.m.
After the birth, the mother and baby were taken to an area hospital, and the paramedics and firefighters continued working for the rest of the night. 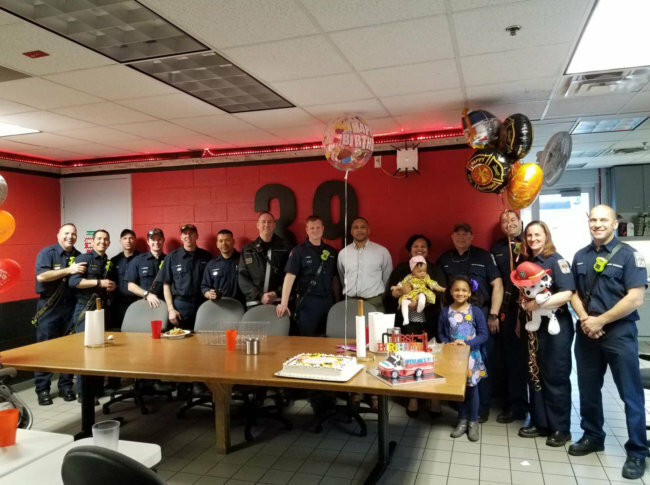 Fast forward a year, and the family of baby Lauryn reached out to the members from Station 39 to include them in Thursday’s birthday celebration. The birthday bash included a “Happy First Birthday Lauryn” sign outside the fire station, two cakes (one shaped like a miniature ambulance), balloons and a photo shoot with Lauryn and mom by a fire truck. “Cake, balloons and Lauryn’s big sister, who was a big help during the delivery, were all part of the celebration,” the fire department said.